There are your typically wedding registry gifts - plates, towels, toasters - and then there are other gifts that are so special and personal they'll be cherished by the new bride and groom for years to come. Wine for a Wedding is one of those wedding gifts (it makes a great bridal shower gift too!). 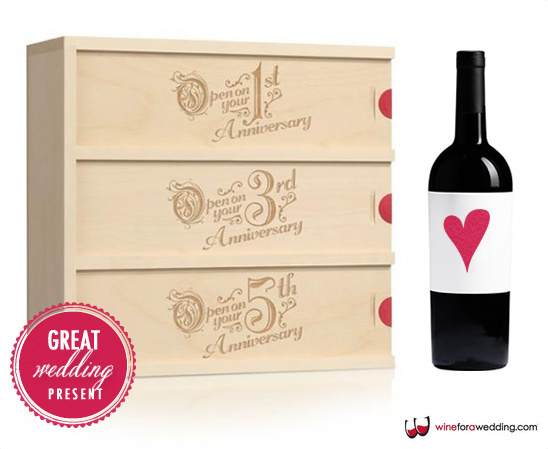 Wine for a Wedding is a personalized wine box created to age 3 bottles of wine for future anniversary celebrations. 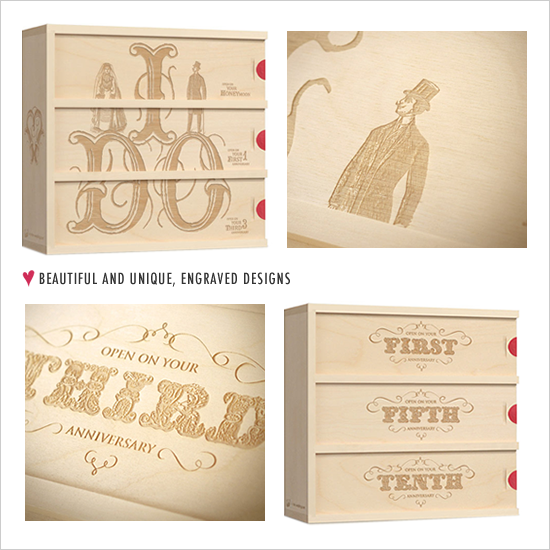 Each wine box features a unique, engraved design that includes “Open On Anniversary" instructions for each compartment. As a couple reaches each anniversary, they open a compartment to reveal a bottle of aged wine along with a personal, custom engraved message from you - on the back of each lid. Wine for a Wedding gives you the option to add your own wine or select a wine package from their wine partners so you can have the complete package shipped directly to the couple (An easy option in case you are not able to make it to the wedding). With 10 unique designs to choose from, as well as the ability to create your own box, you're sure to find something for every couple. 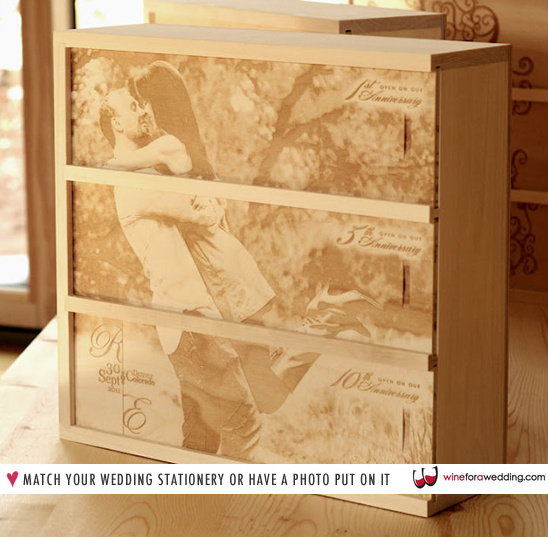 We adore the quirky I Do Box, but for the couple who requires that something extra special, you can create a custom box from a photo, monogram, invitation, or if you fancy yourself an artist—something designed by you. Contact them about these custom options. Also - be sure to become one of their Facebook fans. Each week they are giving away a box to one of their fans. Don't worry re-gifting is totally acceptable in this case. Visit their facebook page for more details.